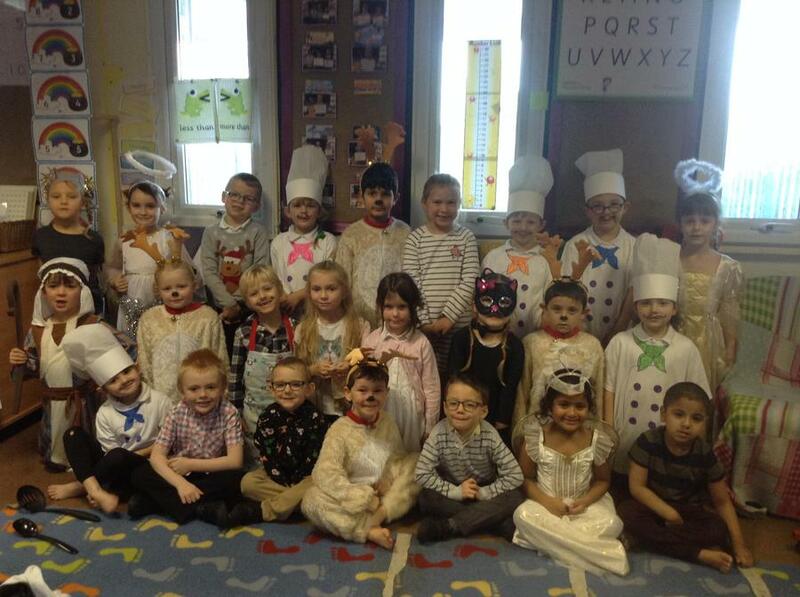 This week we have been really busy performing our Christmas play to all our parents and carers. 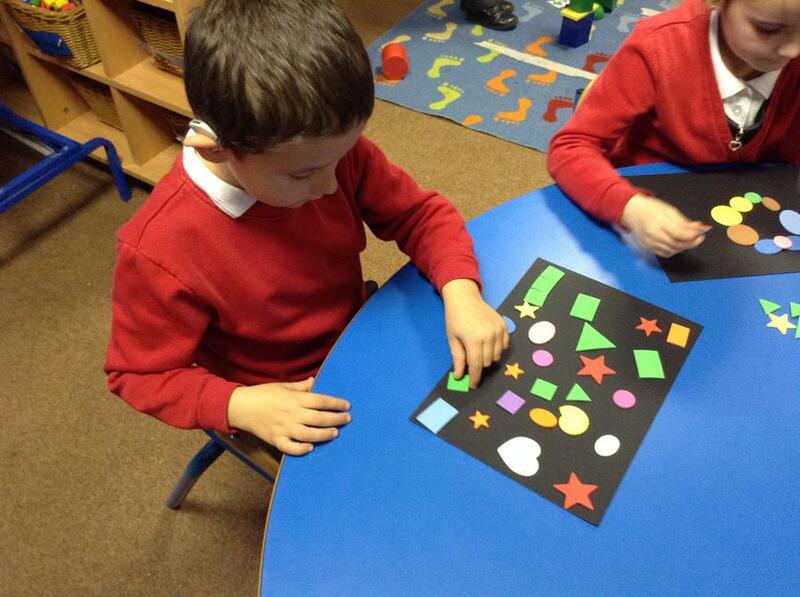 We have also had lots of fun in the classroom making christmas cards and calendars. 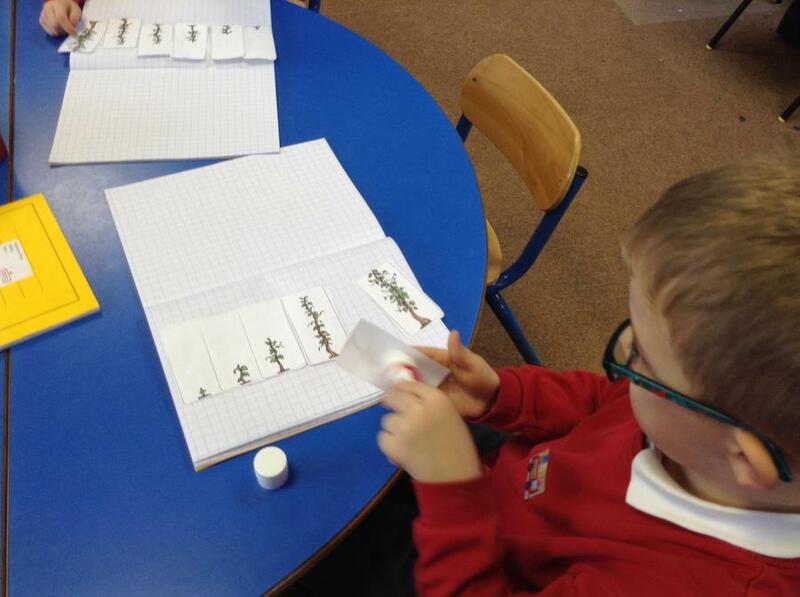 This week we have been busy working on the Christmas story. 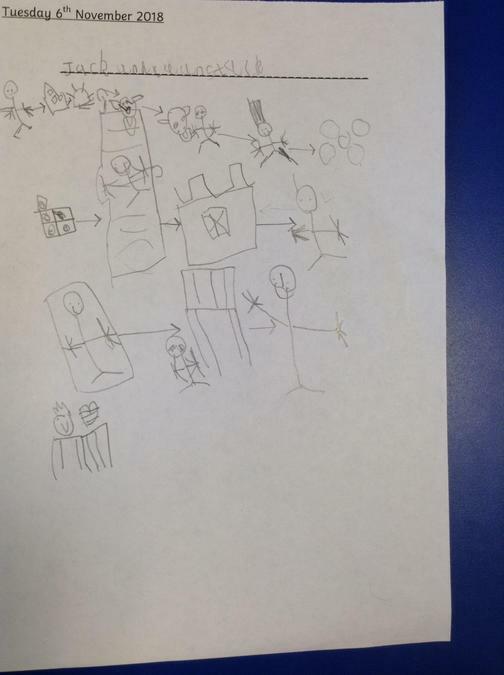 When Mary and Joseph went to Bethlehem and baby Jesus was born. 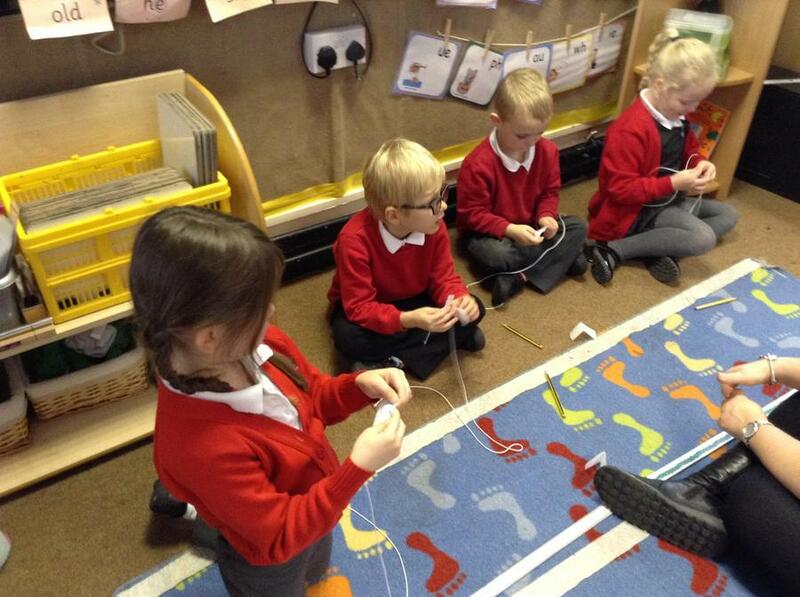 We have also thought about what gifts we would take for the baby if we were a shepherd or a king. 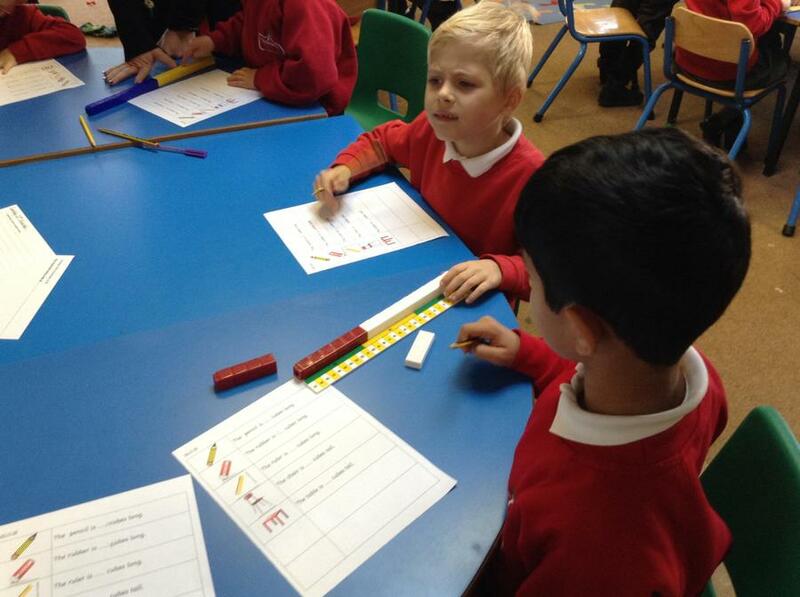 We have been reviewing all of the maths we have learnt so far including part, part, whole, number bonds, using a number line, addition and subtraction number sentences. 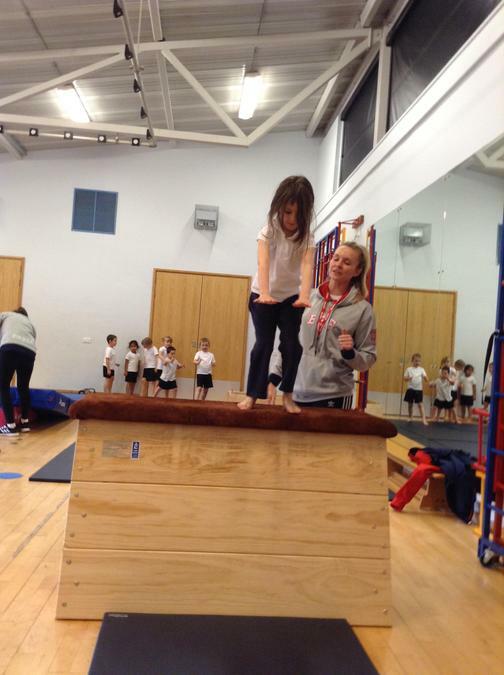 Also we had another brilliant gymnastics session with the forever sports coaches. 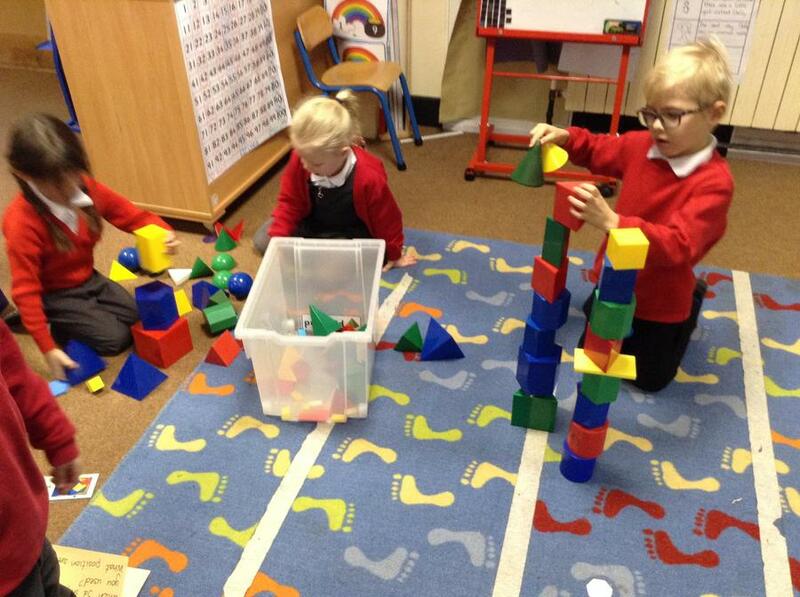 We used the new vault and practiced our balances, forward rolls and flips. 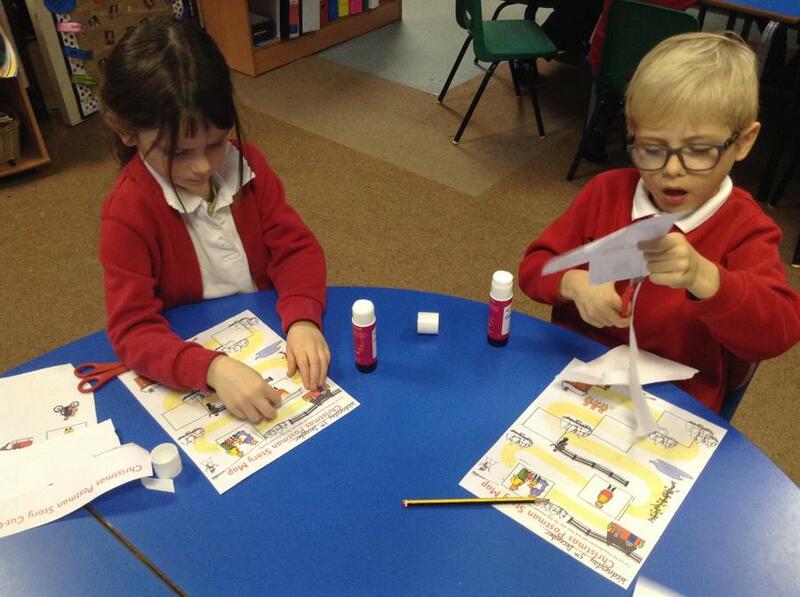 This week we have looked at a new book called 'The Jolly Christmas Postman.' 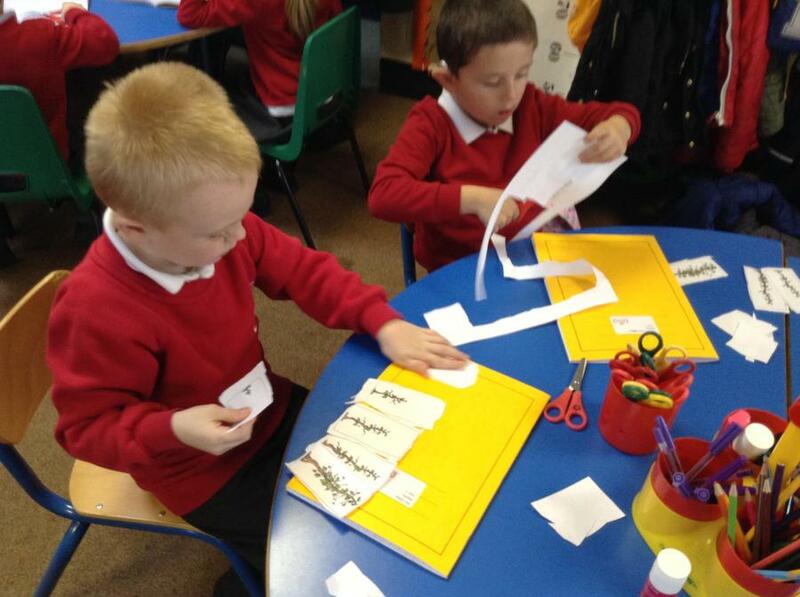 The Postman delivers different gifts, cards and letters to fairytale characters. 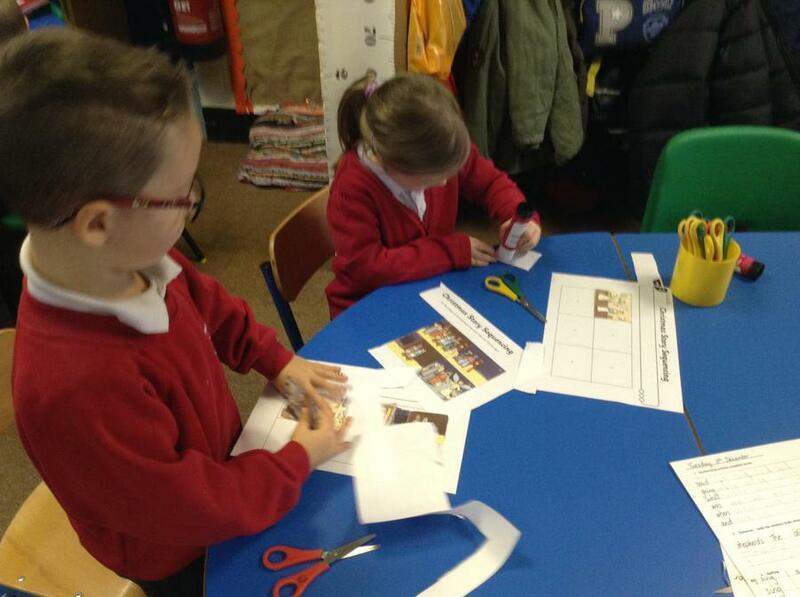 We have been looking at how to order our stories using first, after, before, then and finally. 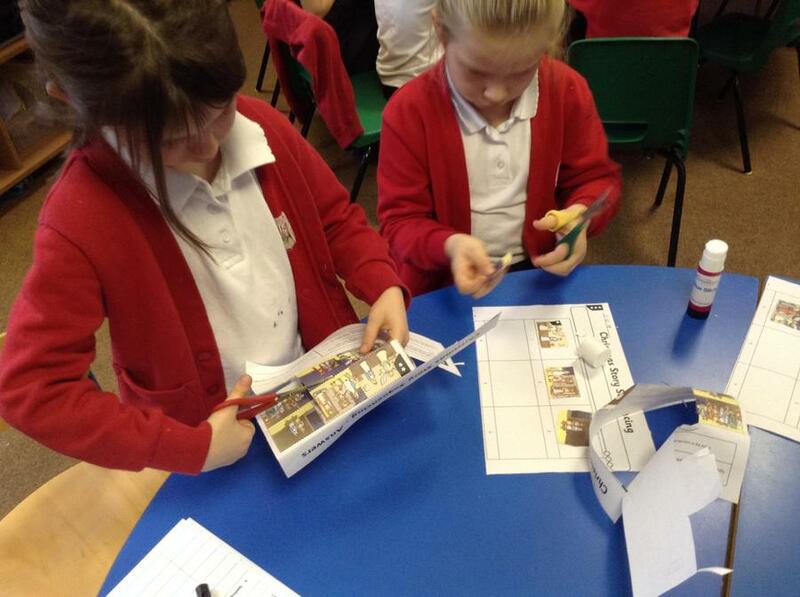 Then we rewrote the story using the time connectives we have learnt. 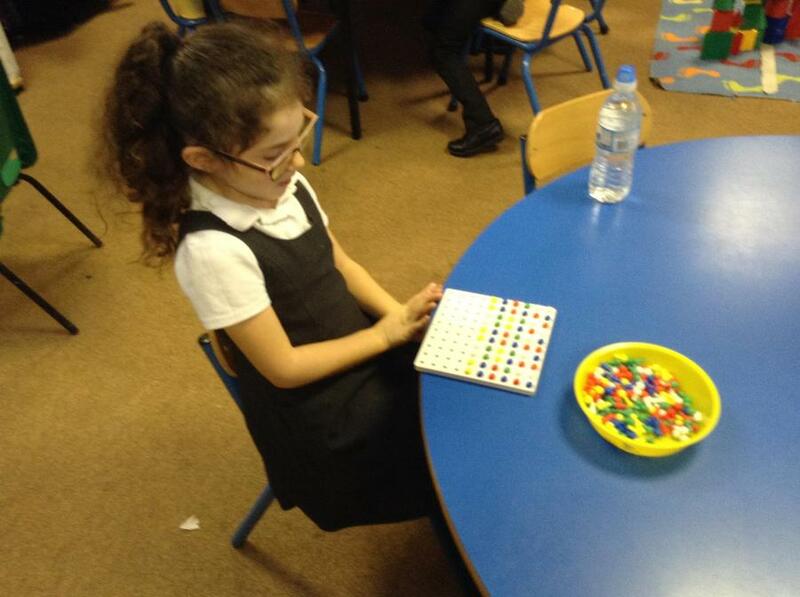 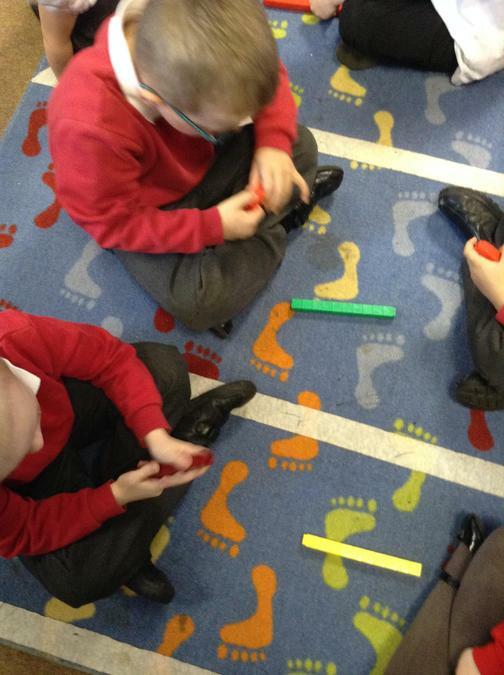 We have also been working on counting in 2's, 5's and 10's this week. 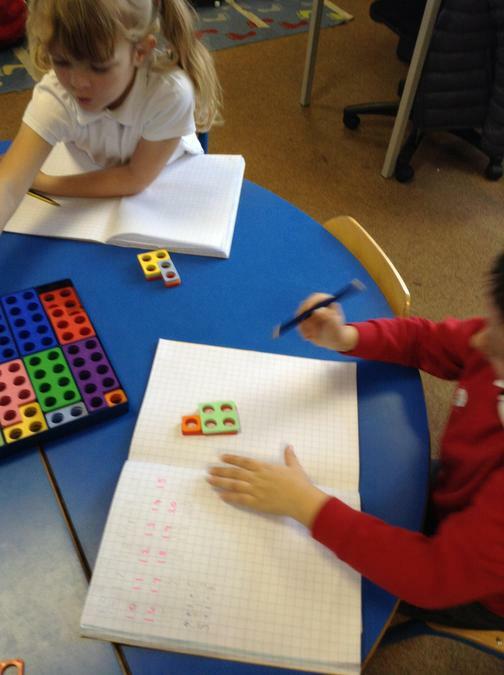 We have done this in lots of different ways using a counting stick, Number Squares and missing number strips. 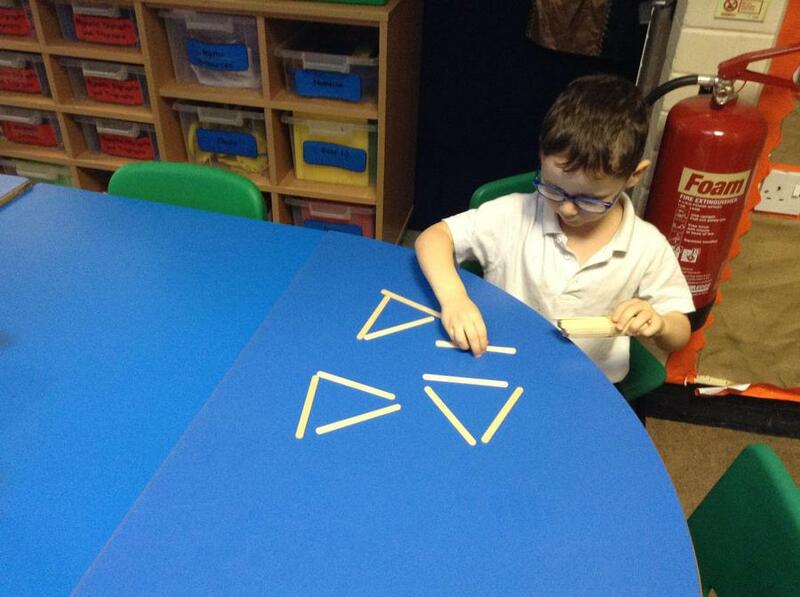 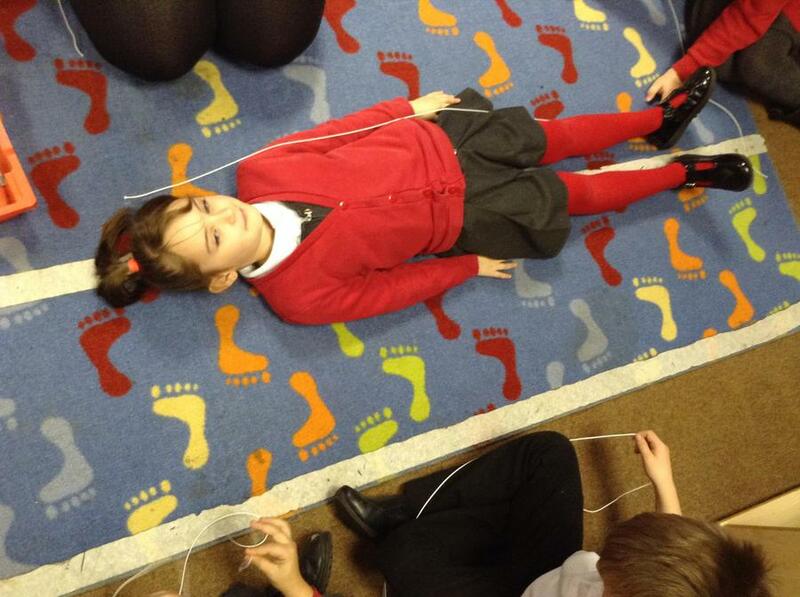 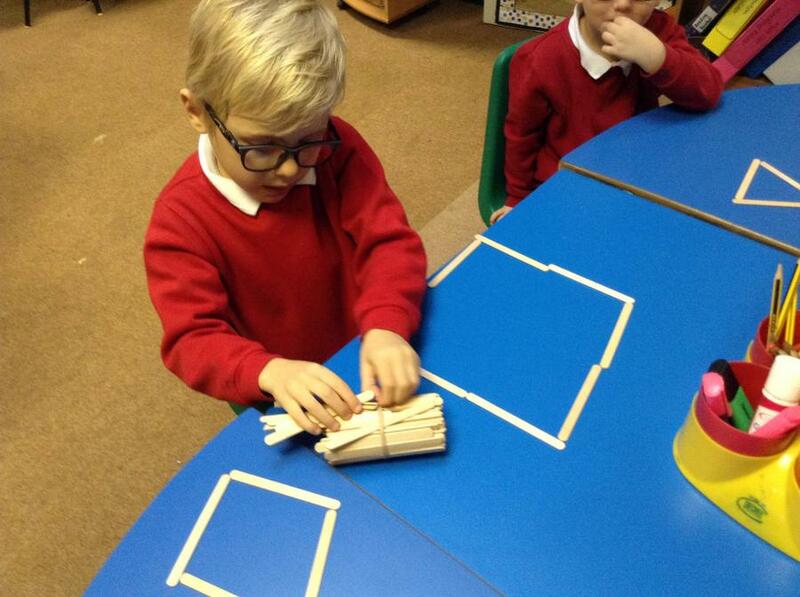 On Tuesday this week we had a morning of shape, space and measure. 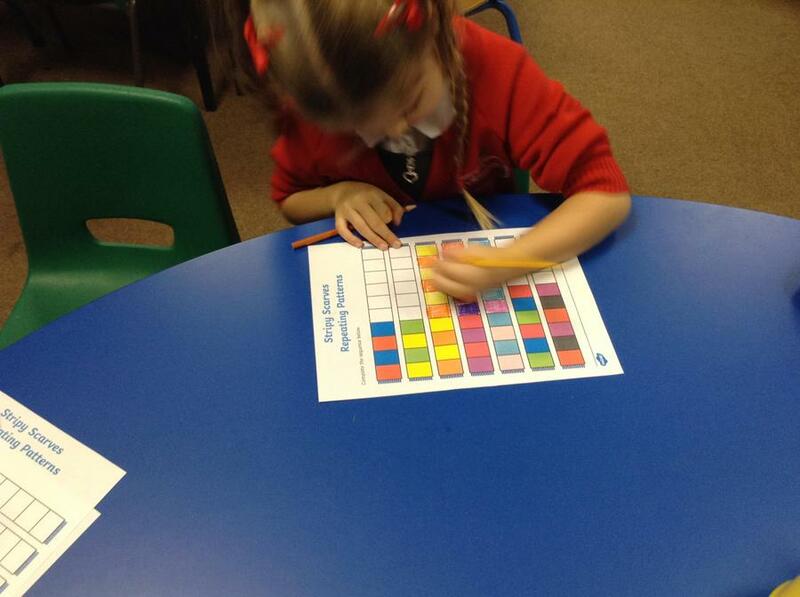 We had 6 different activities to do. 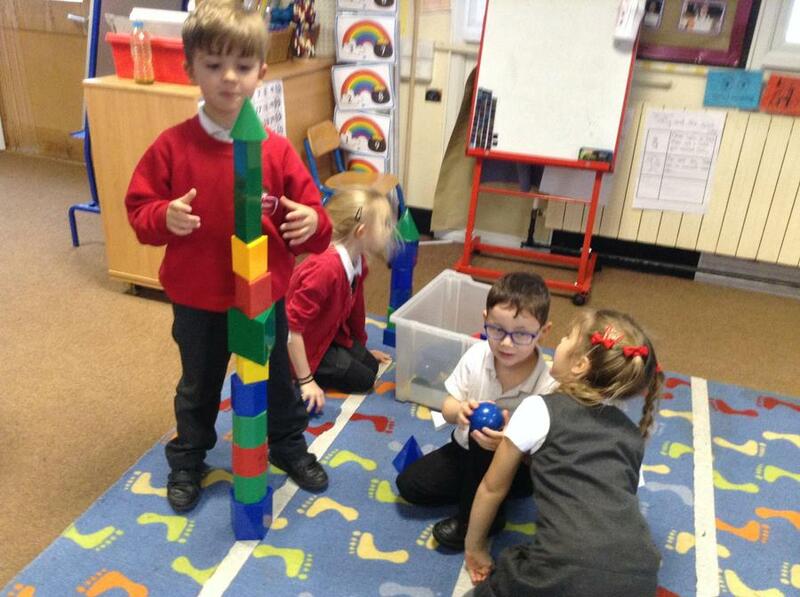 Measuring how tall we all are, foam shape pictures, repeating peg patterns, stick shapes, 3D shape rockets and colour repeating patterns. 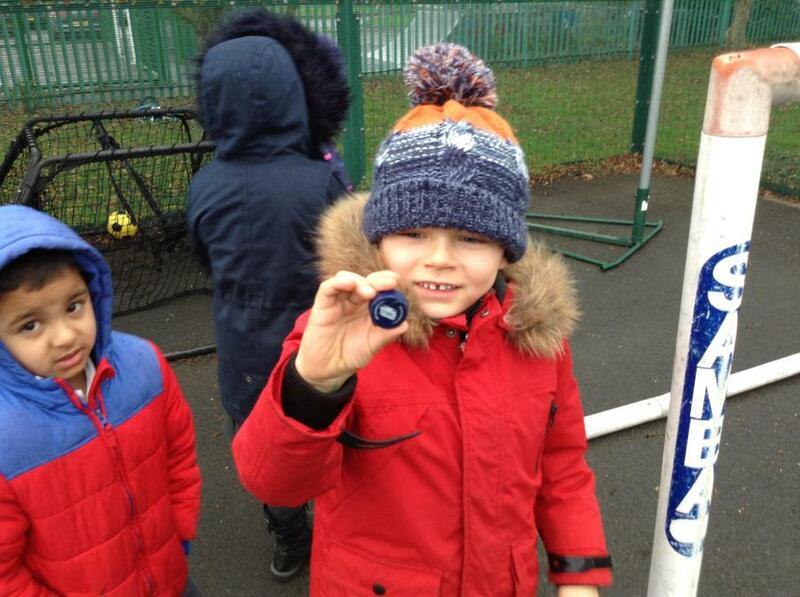 We also went on a class shape hunt outside. 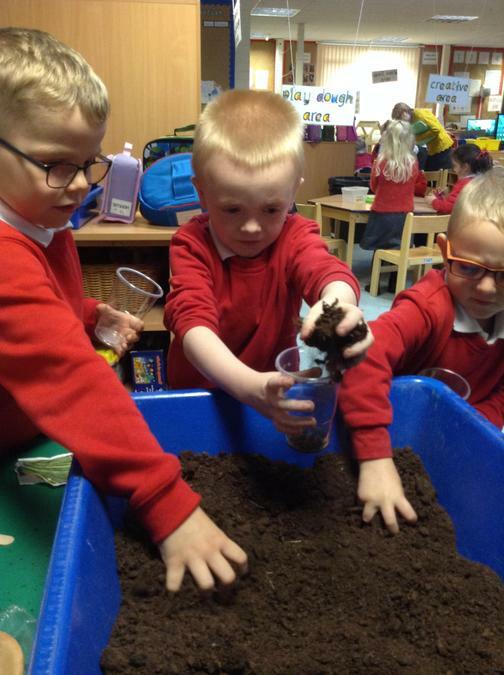 We have finished our bean experiment this week and found that the bean that grew the best was the one planted in soil that was watered and had light. 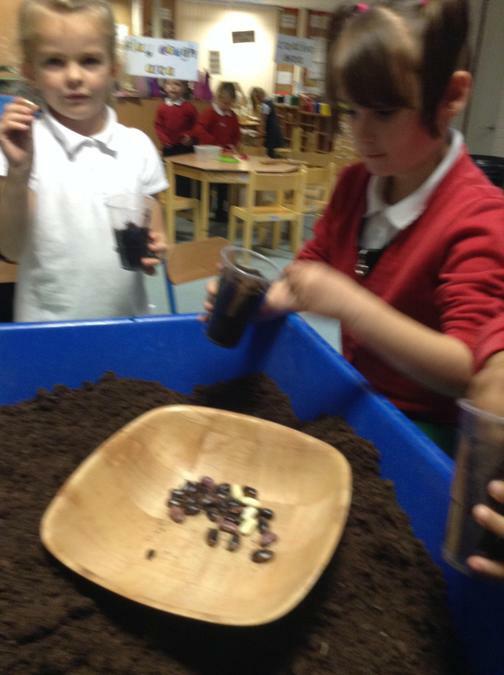 We measured the beans and finished our bean diaries and have taken the beans home. 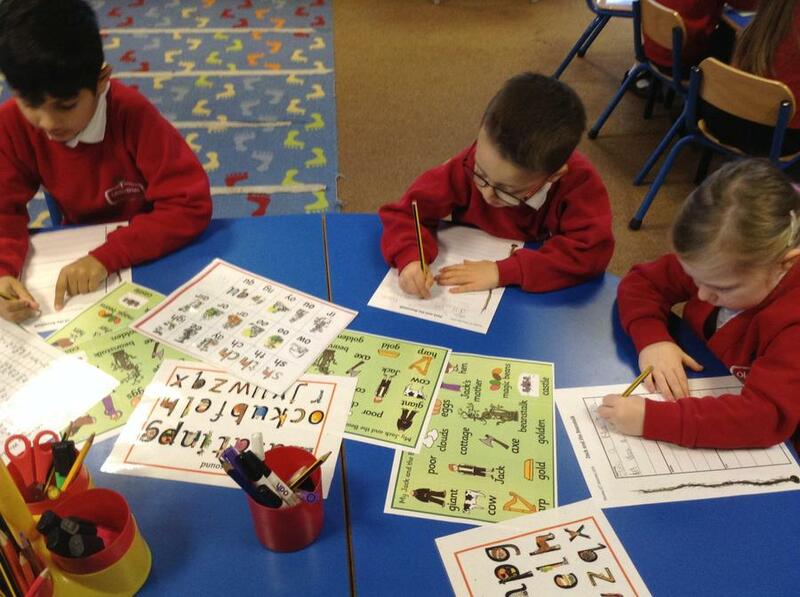 This week in Year 1 we have been writing our own stories based on Jack and the beanstalk and changing parts of it. 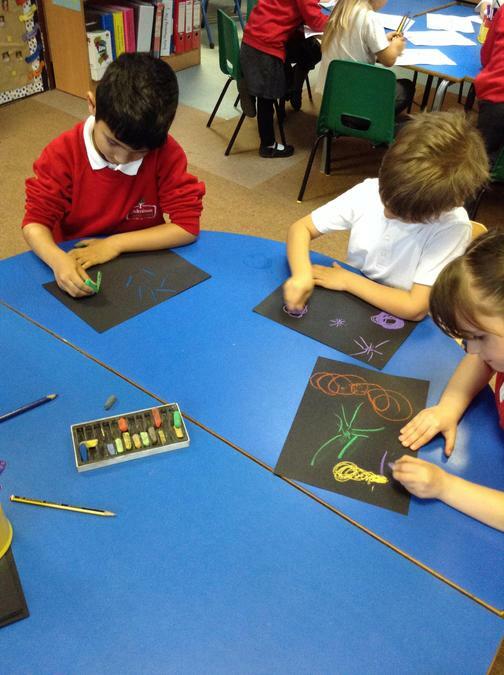 We changed the main character, where they live, what grew and who was at the top of the clouds. 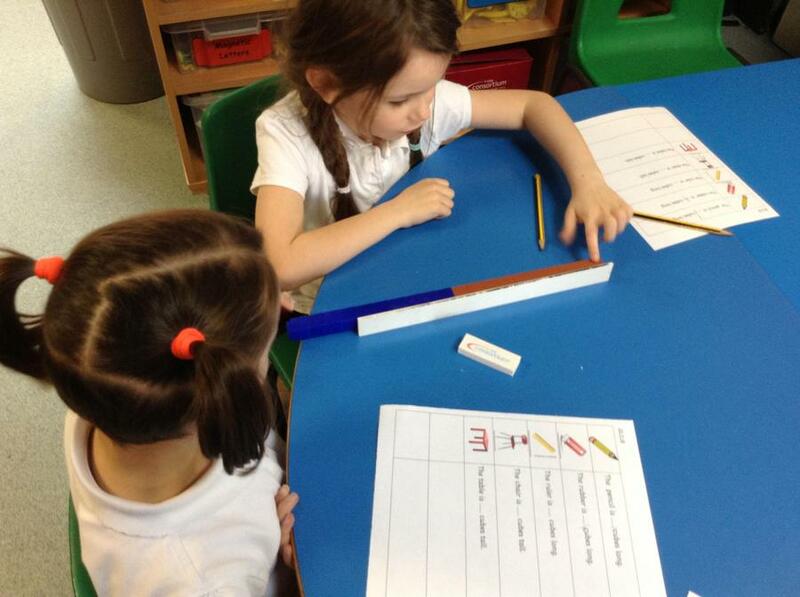 We have also been doing lots of measuring. 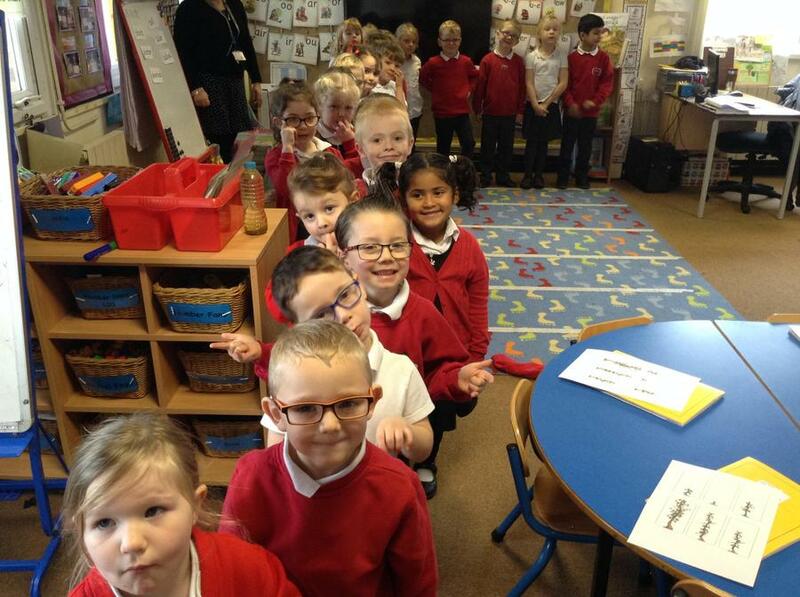 We started the week by seeing how tall we were and putting ourselves in order from smallest to tallest and then did the same with beanstalks. 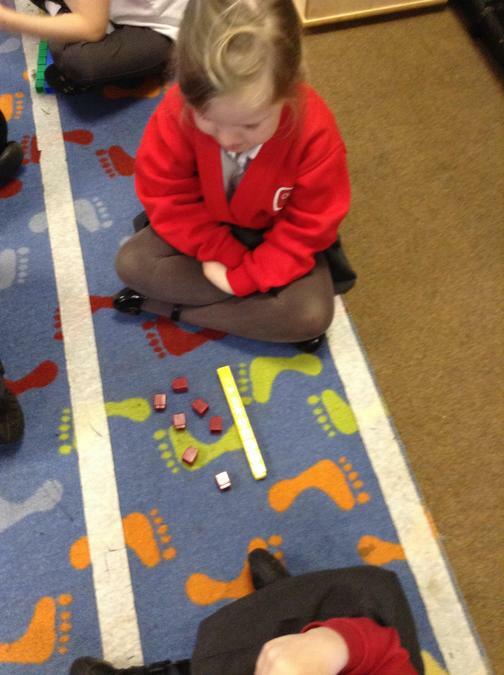 Then we moved on to measuring different objects with cubes and used rulers and looked at centimeters. 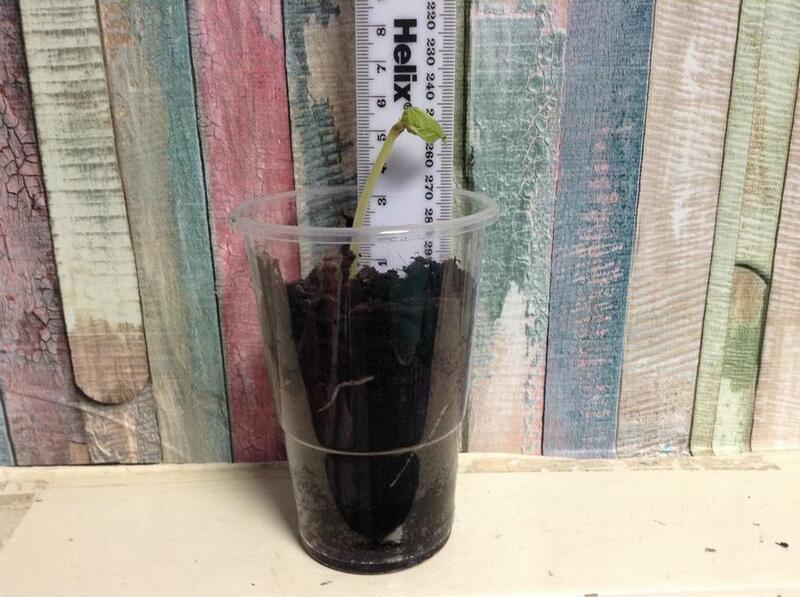 We have kept our bean diaries up to date and have been measuring and checking on how our beans are growing. 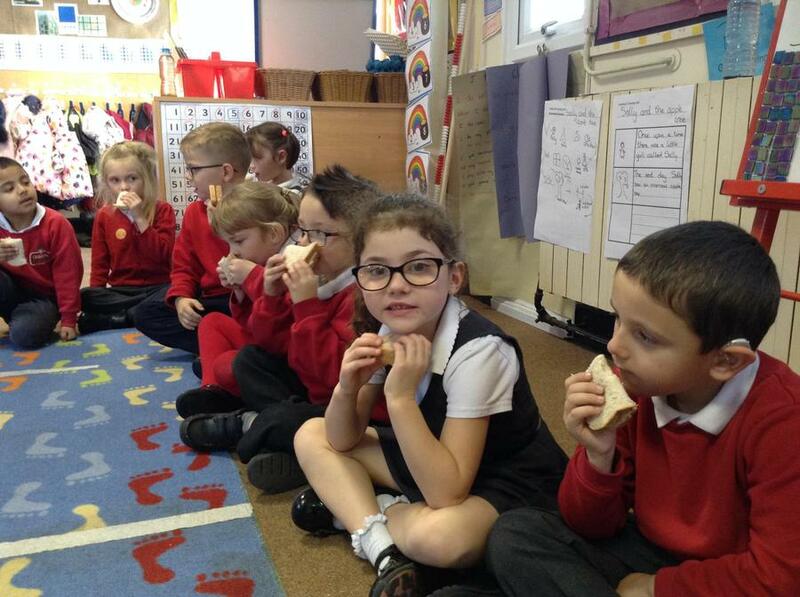 The cress that we have been growing was ready this week so we tried some of it in cheese spread sandwiches or bread and butter. 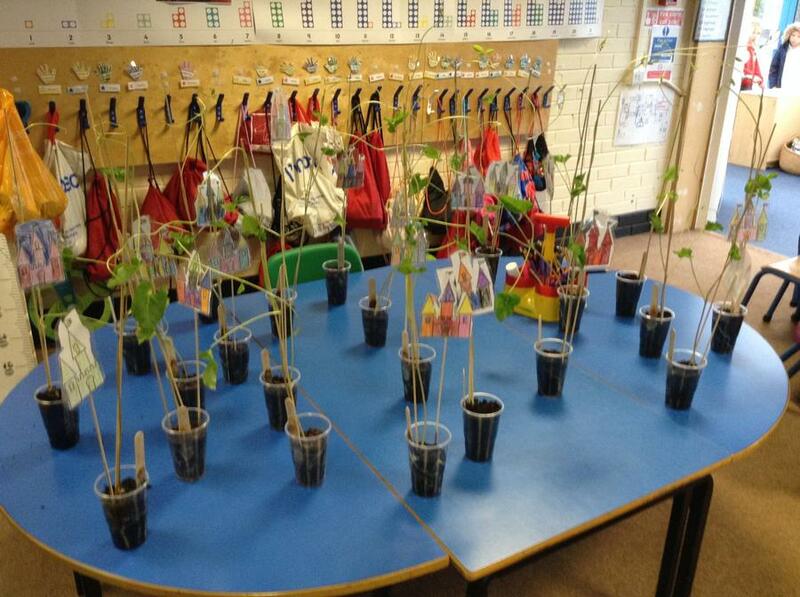 On Friday of last week we planted some magic beans just like Jack from Jack and the Beanstalk. 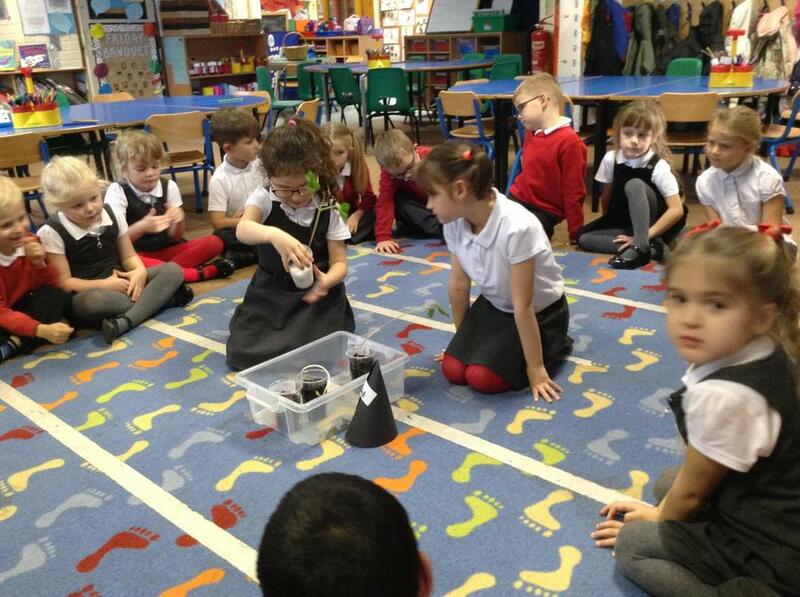 There was a beanstalk in our classroom and some great big footprints. 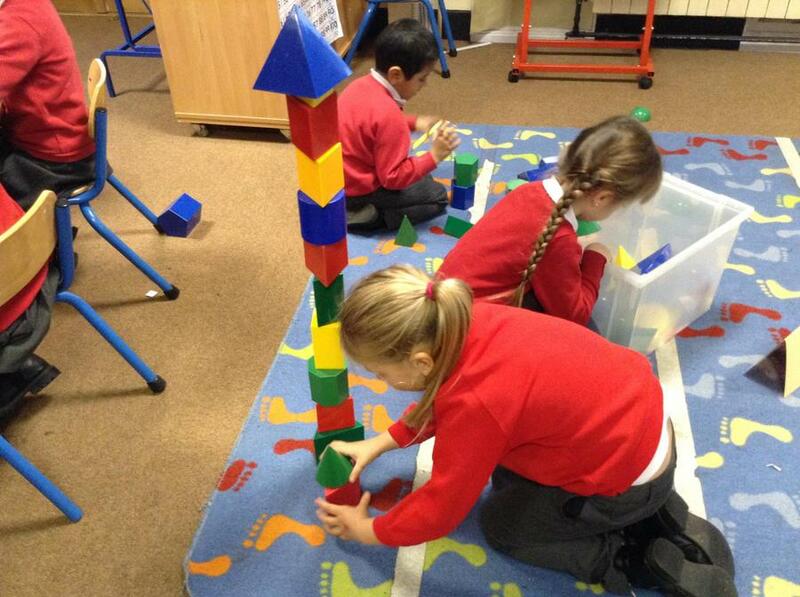 We think the giant might have come down the beanstalk over the weekend. 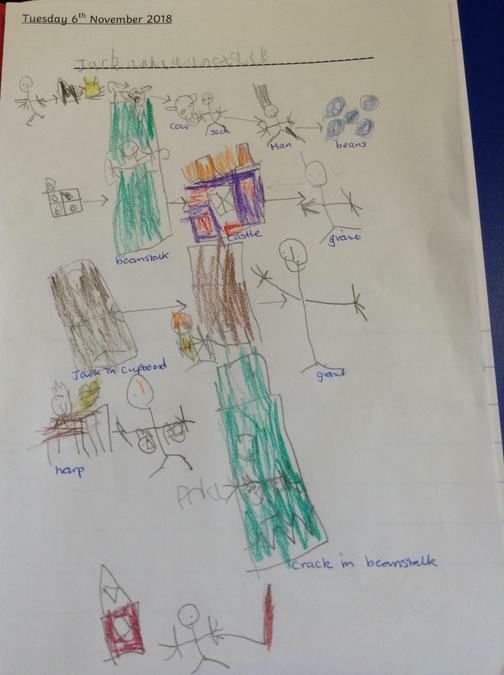 We all wrote down our ideas about where he might have gone and designed wanted posters with descriptions incase anyone sees him around school. 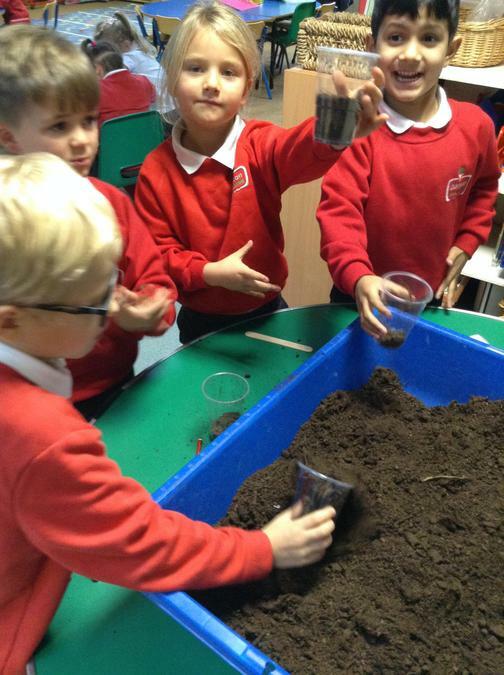 We have looked at different beans this week and some peas to see what they look like when they have grown and ready to eat. 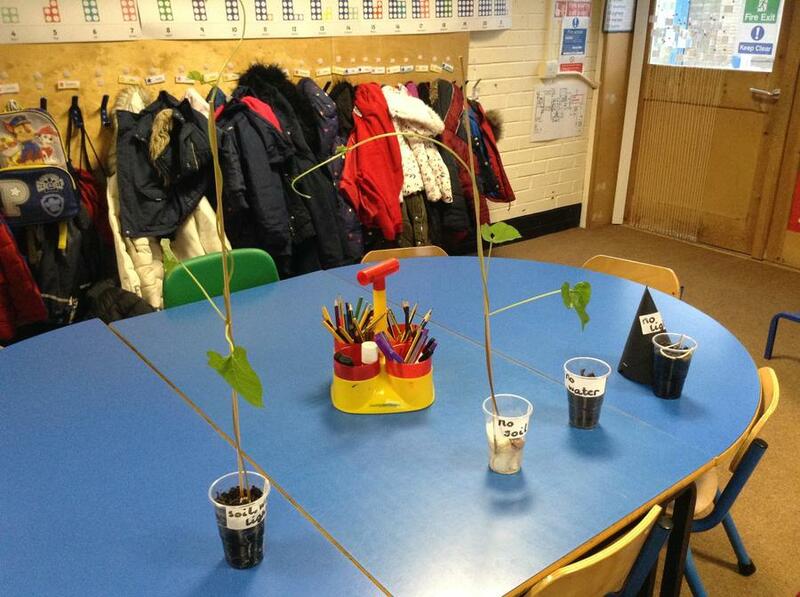 Also we have looked at the life cycle of a bean and checked on how our beans are growing. 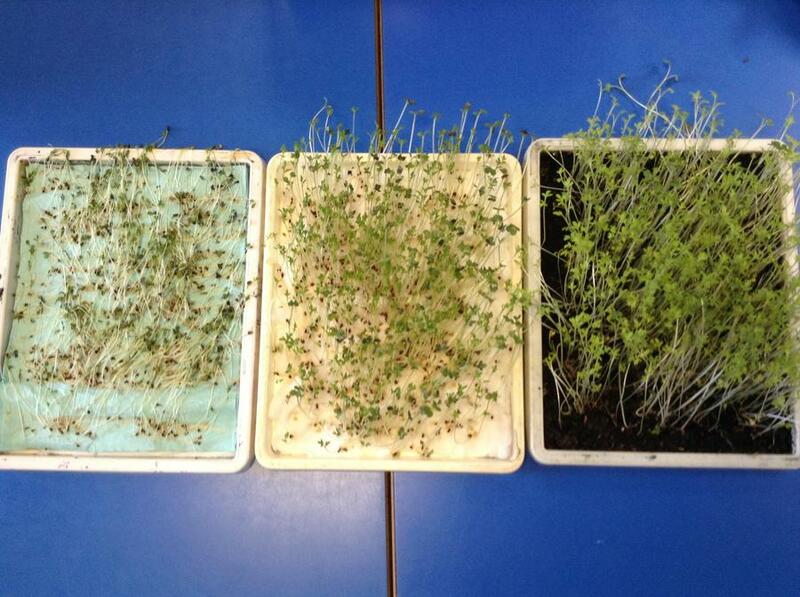 We have also planted cress in soil, paper and cotton wool to see which it grow best in. 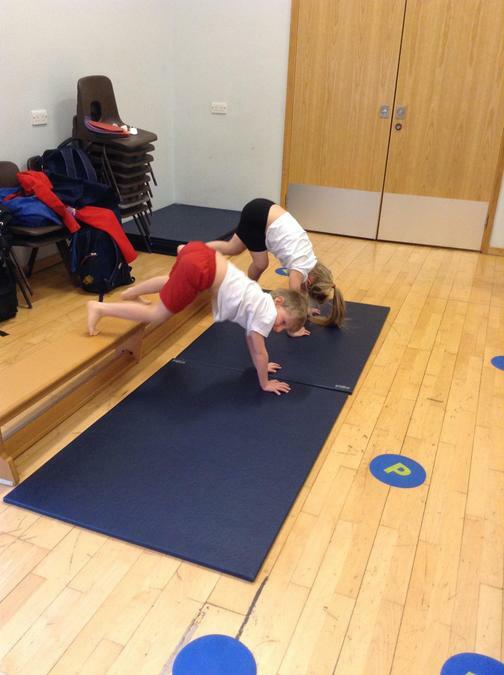 We have had our 2nd gymnastics lesson and have been practicing lots of new skills. 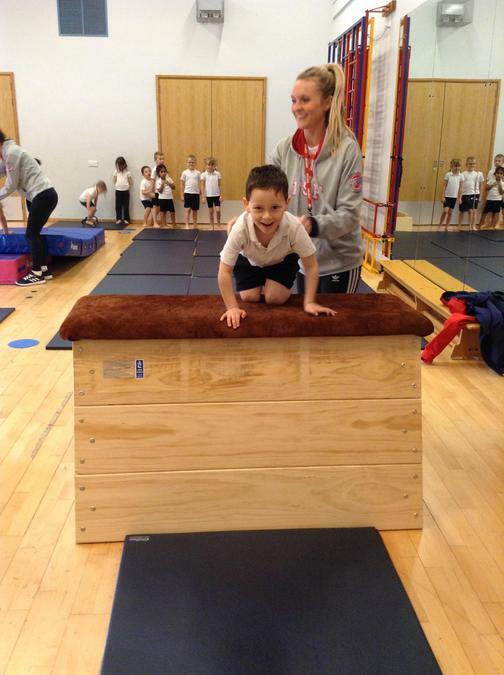 We have worked on our balancing, forward rolls, jumping and forward flips. 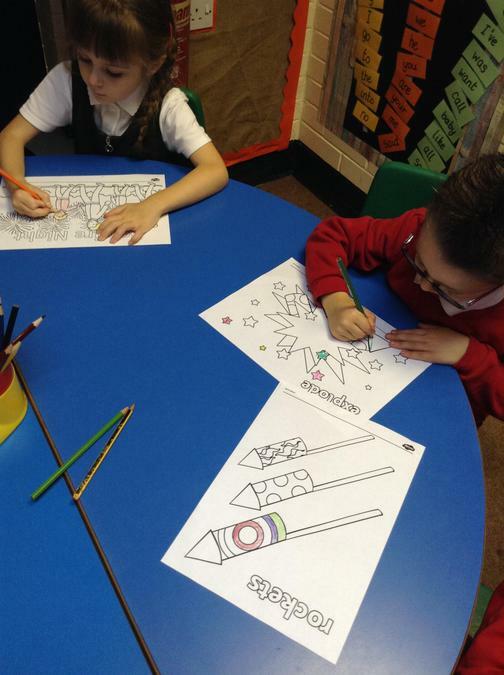 We have looked at how to be a kind friend for anti bullying week and worked together to create our own class kindness wreath. 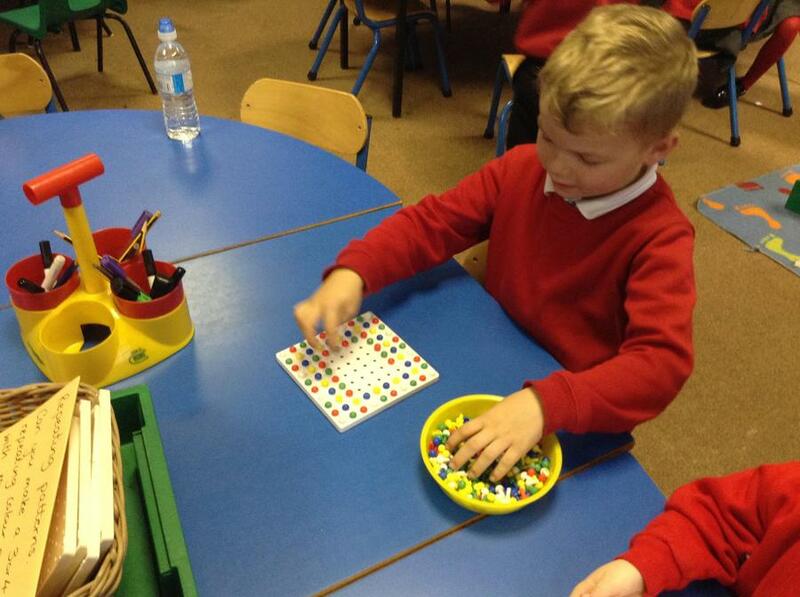 We have had a very busy week back at school. 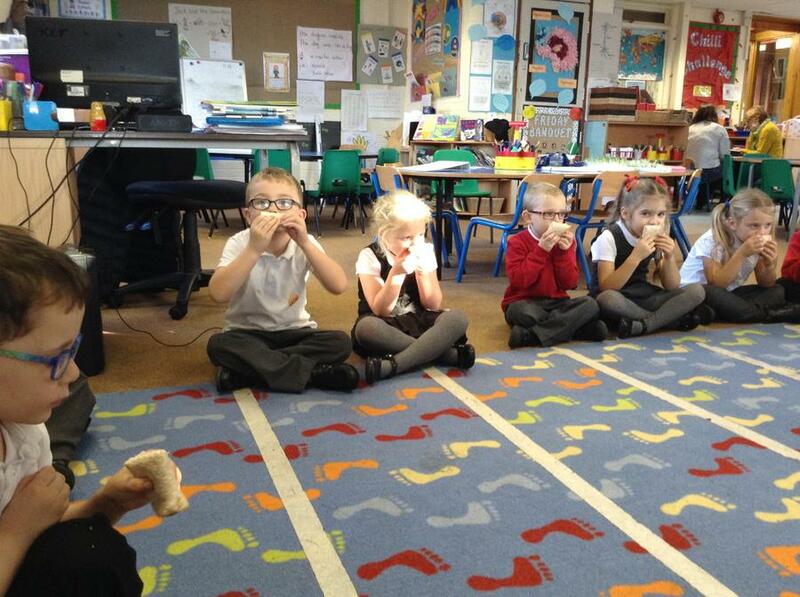 We have started to learn our new story 'Jack and the Beanstalk.' 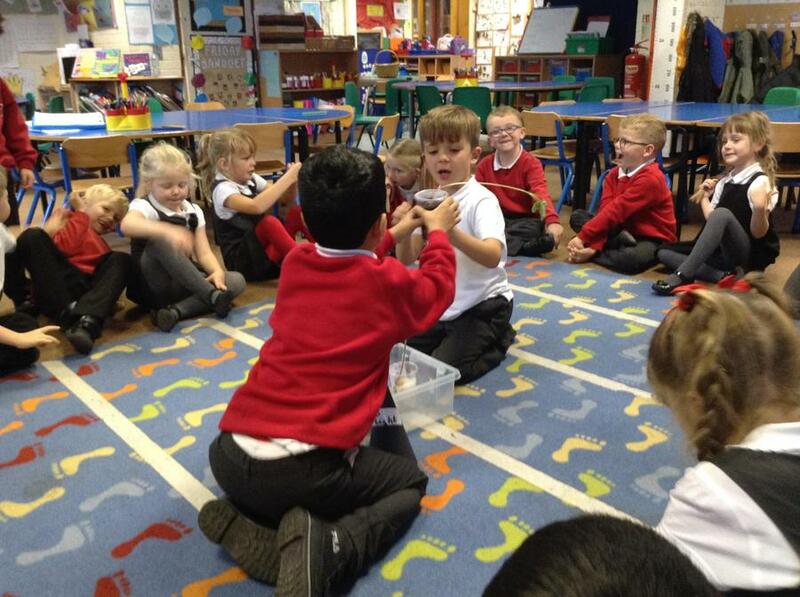 After we listened to the story we made up actions to help us remember all the different things that happen. 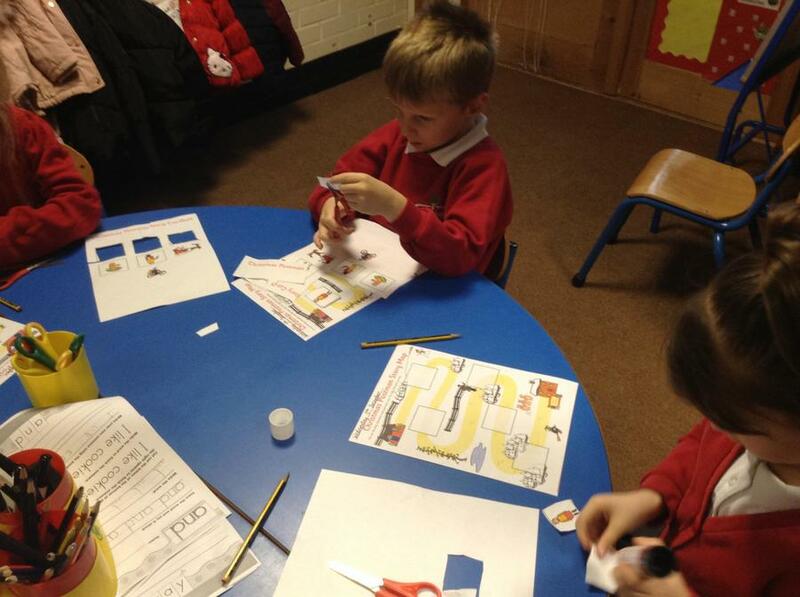 Then the following day we mapped out the story using a story map. 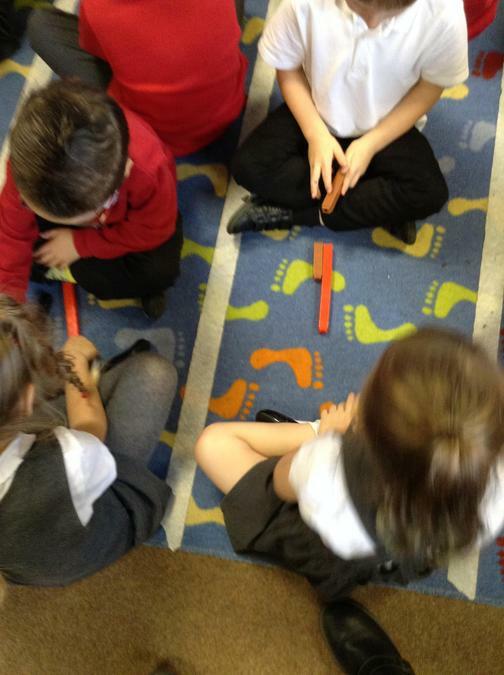 Then we retold the story in our own words. 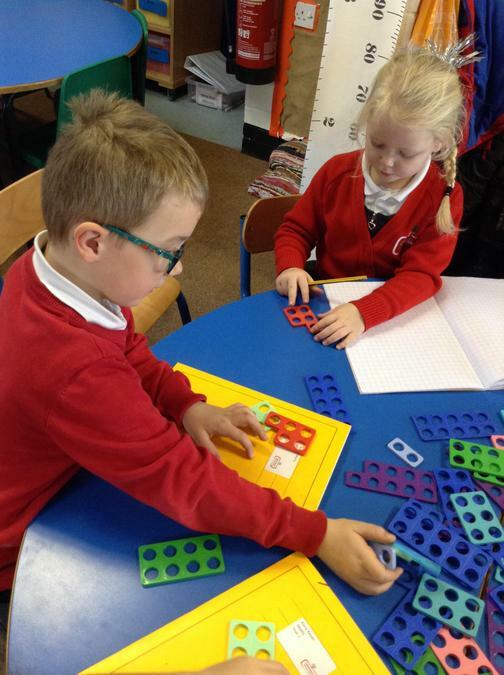 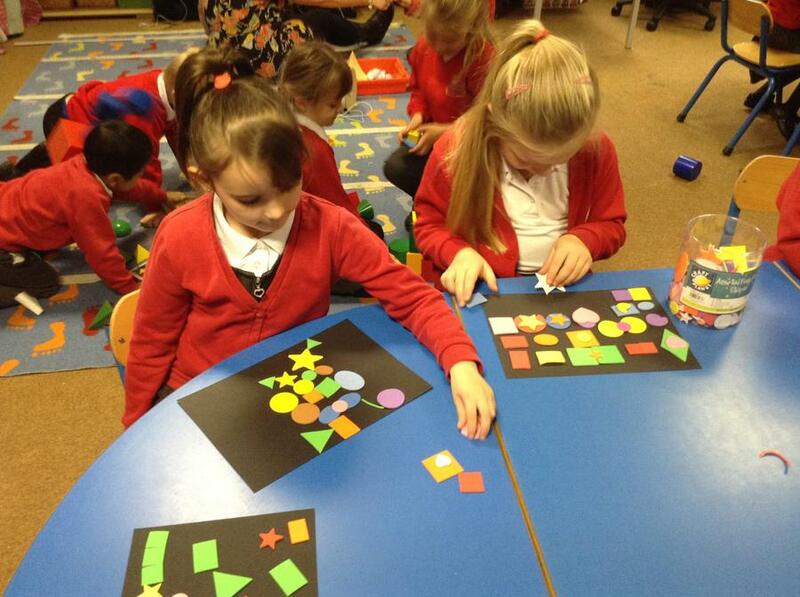 For Maths we have been looking at 10's and 1's we have done this in lots of different ways. 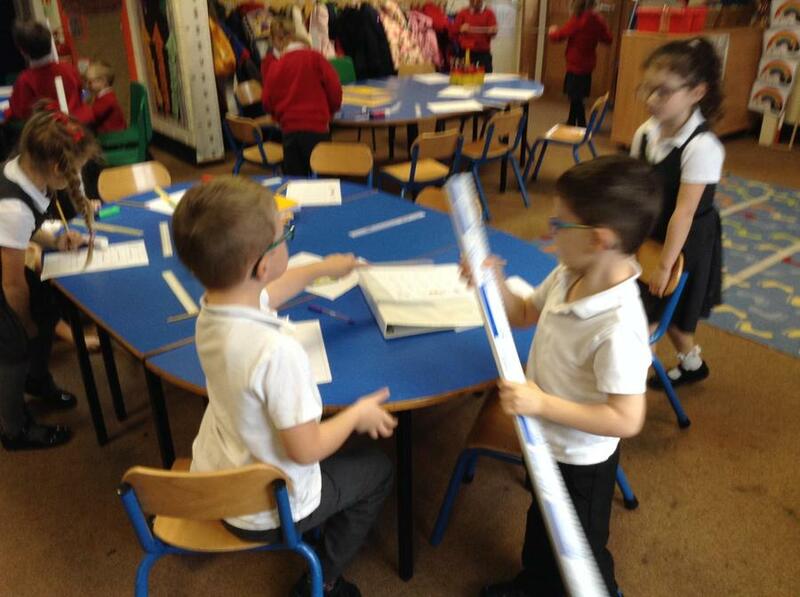 We have used towers of 10, a 10's frame, part, part, whole model and bar models. 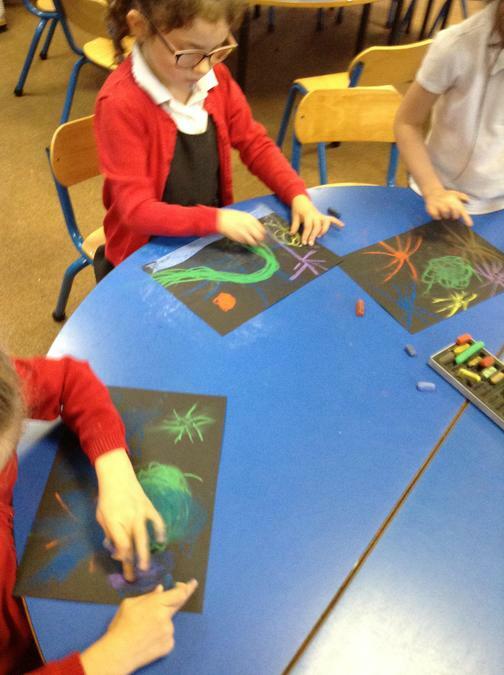 In the afternoons we have made our own firework pictures and talked about how to be safe around fireworks. 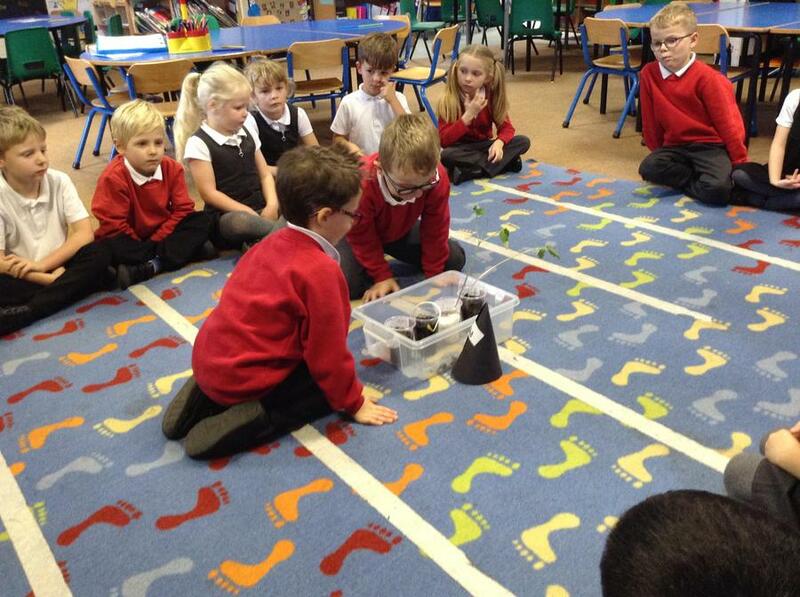 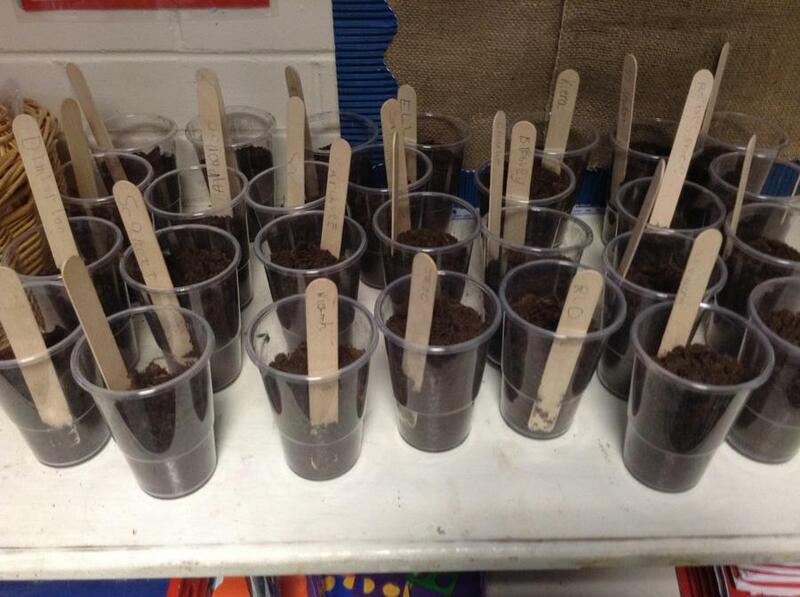 We have also planted beans, first we talked about what our beans would need to grow sunlight, soil, water. 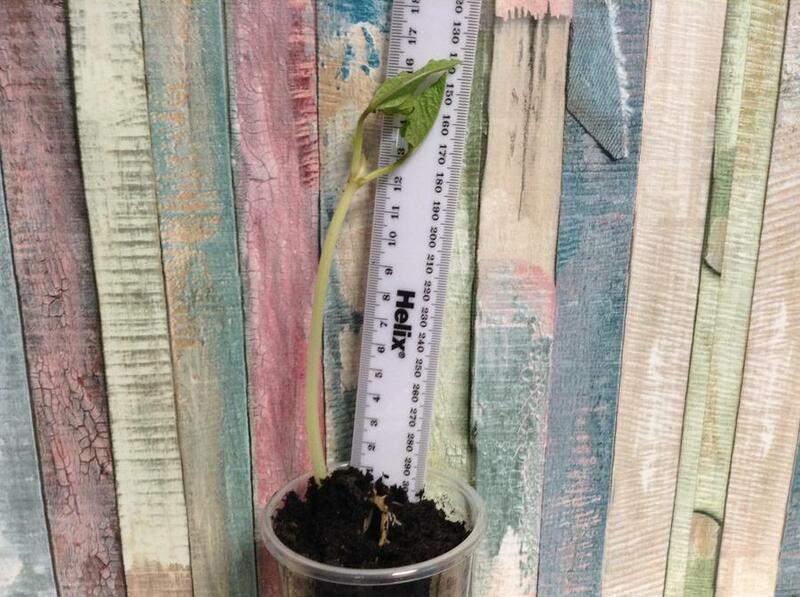 We decided to plant some beans without these things to see what would happen. 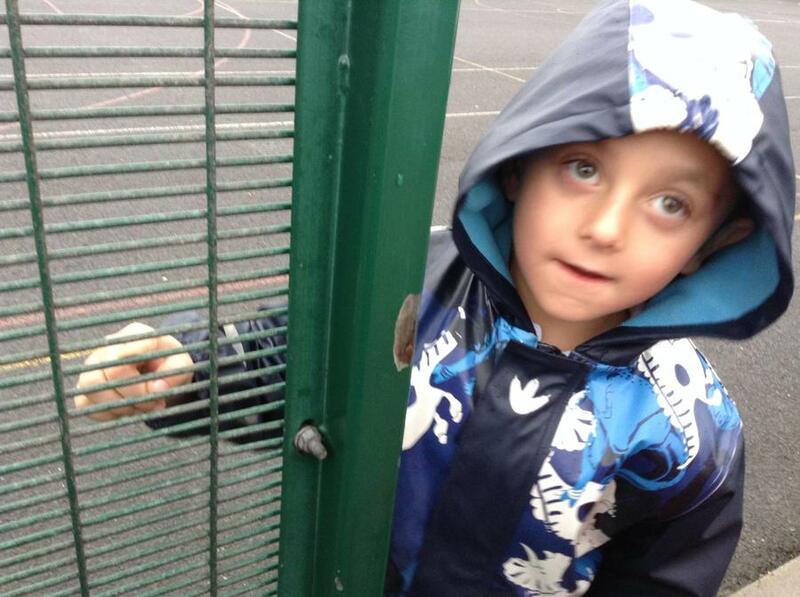 We will let you know over the coming weeks. 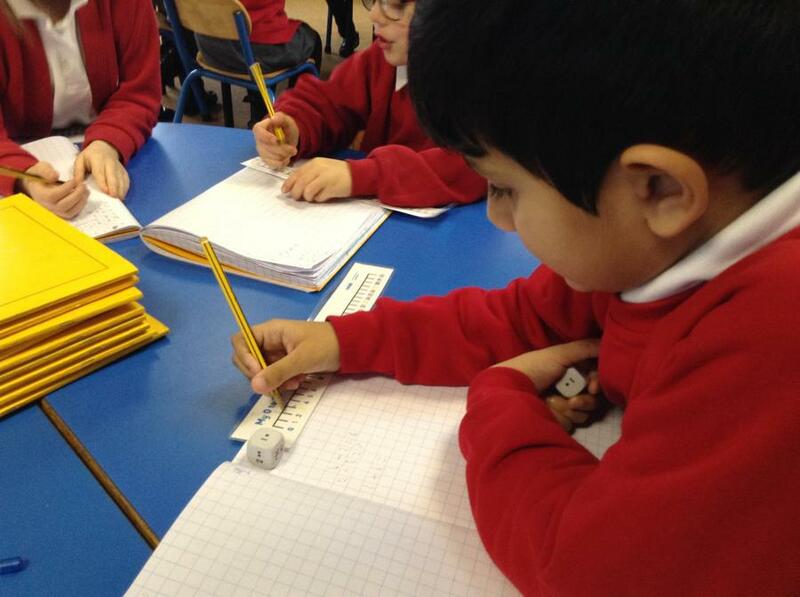 Also we have started our own bean diary so we can keep a record about what is happening to them.